A taste of Italy right in the heart of Las Vegas, The Venetian Hotel and Casino features a scaled down version of the Grand Canal complete with Gondolas, the St Mark's Campanile, and the Rialto Bridge all famous landmarks of Venice. As dusk falls over Las Vegas in Nevada, the lights and billboards of the city burst to life. 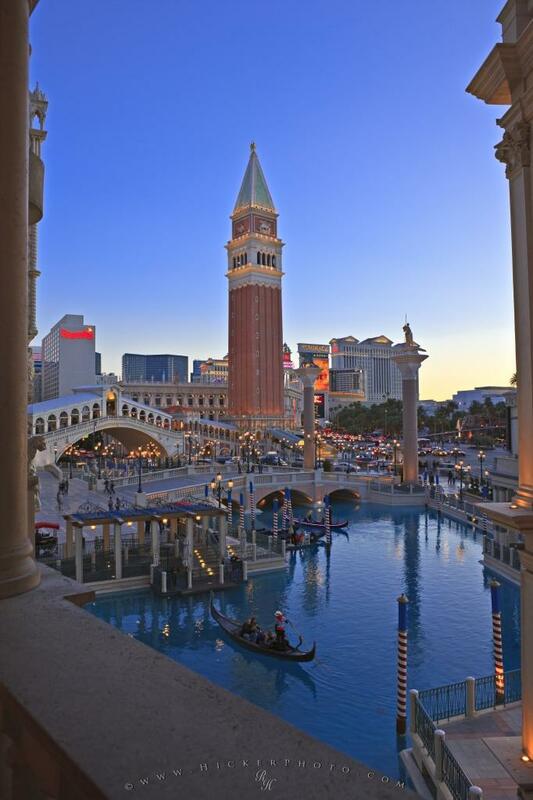 Gondolas float on the Grand Canal at The Venetian Hotel and Casino giving visitors a taste of Venice, Italy surrounded by replicas of historic Venetian landmarks such as the St Mark's Campanile and Rialto Bridge. For photographers the Venetian is a "must photograph" location when on a visit to Las Vegas, Nevada, USA. The Venetian Hotel and Casino, Las Vegas, Nevada, USA. city of Las Vegas, Nevada, USA.